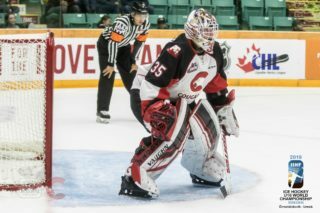 The Western Hockey League announced earlier this morning that Prince George Cougars goaltender Ty Edmonds (1996 – Winnipeg, MB) has been nominated for the Vaughn CHL Goaltender of the Week Award for the week ending December 6th. In three appearances last week, Edmonds posted a 3-0 record with a 0.77 goals-against-average and a .973 save percentage and one shutout. His week started with a 31 save victory Tuesday at home against the Portland Winterhawks. 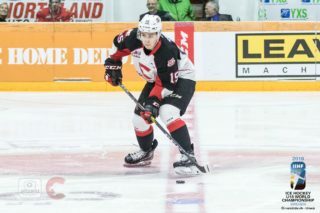 The next night against Portland, Edmonds came into the game in relief and turned aside all 15 shots he faced as the Cougars managed to comeback and earn a 5-3 victory. But Edmonds’ best performance was yet to come. Friday night in Everett Edmonds stopped all 27 shots he faced to record his fourth career shutout (and second of the season) in a 3-0 Cougars victory over the Silvertips. Twice last week he was named second star (on December 1st and December 4th). This is the second time during his three year career that Edmonds has been nominated for this award. He was also nominated in October, 2013 when he won the honor beating out Philippe Cadorette of the Baie-Comeau Drakkar and Sault Ste. Marie Greyhounds netminder Brandon Halverson. So far this season, Edmonds has posted a 9-4-1-0 record with a league high .938 save percentage and a 1.98 goals-against-average which puts him second behind only Everett’s Carter Hart (1.72). For his career, Edmonds has compiled a record of 57-47-5-7. 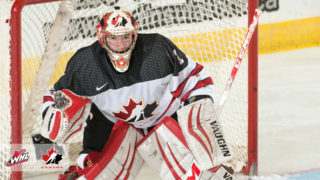 His 57 victories place him third all-time in victories for a Cougars goaltender. Ahead of him now are Billy Thompson (64) and Scott Myers (95). 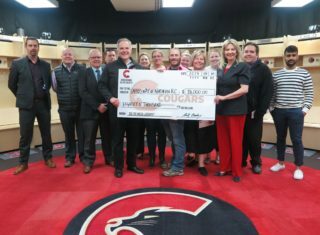 Edmonds and the Cougars are on a roll having won five straight games and are currently riding an eight game regulation unbeaten streak that started back on December 20th in Lethbridge. The Cougars are also unbeaten in regulation in nine straight home games. They’ll put all of those streaks on the line tomorrow night when they welcome the Kootenay Ice to the CN Centre for their lone meeting of the 2015-16 season. For tickets, call Ticketmaster at: 250-564-5585 or call the Prince George Cougars office at: 250-561-0783.